Asteraceae or Compositae (commonly referred tae as the aster, gowan, or sunflouer faimily), is a ower lairge an widespread faimily o Angiospermae. The group haes mair than 23,000 currently acceptit species, spread athort 1,620 genera (leet) an 12 subfaimilies. In terms o nummers o species, Asteraceae is rivaled anly bi Orchidaceae. (The whilk o the twa faimilies is actually lairger isna clear, awin tae uncertainty aboot exactly hou mony species exist in each faimily). The main featur o the faimily is the composite flouer type in the fairm o capitula surroondit bi involucral bracts.The name "Asteraceae" comes frae Aster, the maist prominent genus in the faimily, that derives frae the Greek ἀστήρ meanin starn, an is connectit wi its inflorescence starn fairm. As for the term "Compositae", mair ancient but still valid, it obviously maks reference tae the fact that the faimily is ane o the few angiosperms that hae composite flouers. This faimily haes a remarkable ecological an economical importance, an is present frae the polar regions tae the tropics, colonizin aw available habitats. The Asteraceae mey represent sae muckle as 10% o autochthon flora in mony regions o the warld. Maist members o Asteraceae are yerbaceous, but a significant nummer are an aa shrubs, vines an trees. The faimily haes a warldwide distribution, an is maist common in the arid an semi-arid regions o subtropical an lawer temperate latitudes. Asteraceae is an economically important faimily. Some members provide products includin cuikin iles, lettuce, sunflouer seeds, artichokes, sweetenin agents, coffee substitutes an yerbal teas. Several genera is popular wi the horticultural community, includin marigowd, pot marigowd (forby kent as calendula), cone flouers, various gowans, fleabane, chrysanthemums, dahlias, zinnias, an heleniums. Asteraceae are important in yerbal medicine, includin Grindelia, echinacea, yarrow an mony ithers. A nummer o species hae come tae be considered invasive, includin, maist notably in North Americae, dandelion, whilk wis oreeginally introduced bi European settlers wha uised the young leafs as a salad green. ↑ Germplasm Resources Information Network (GRIN). "Family: Asteraceae Bercht. & J. Presl, nom. cons". Taxonomy for Plants. USDA, ARS, National Genetic Resources Program, National Germplasm Resources Laboratory, Beltsville, Maryland. Retrieved 2008-06-12. ↑ International Code of Botanical Nomenclature. 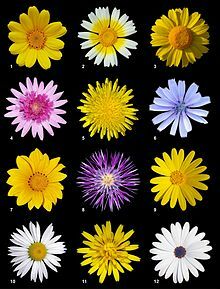 In point 18/5 states: "The following names, uised traditionally, is considered valid: Compositae (Asteraceae...). ↑ "dandelion Taraxacum officinale". Invasive Plant Atlas of the United States. Retrieved 2012-09-10. This page wis last eeditit on 24 Dizember 2015, at 11:17.